Friday May 17, 2019, 10:00am to 7:00pm, NYPD Police Academy — 235 East 20th St. NYC (between 2nd and 3rd Ave). There is limited parking in the area and race participants should not park on 20th St. Family and friends may pick up multiple race kits but should bring the confirmation email. Day of race 7:00am to 9:30am at Oculus Plaza — Corner of Fulton Street and Church Street. ABSOLUTELY NO NUMBER PICK-UP AFTER 9:30am day of race! 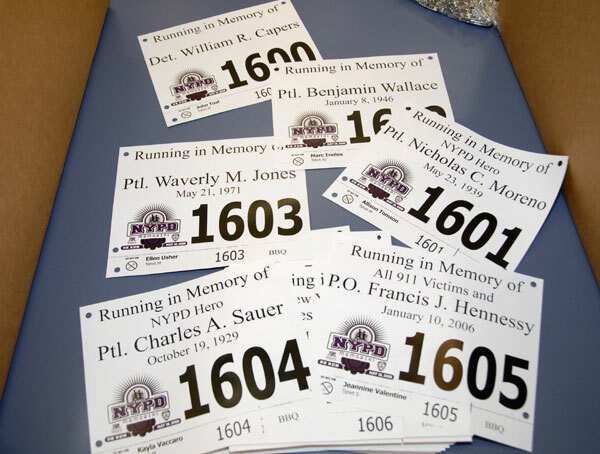 Research your chosen hero at NYPD Angels. Includes Personalized Running Bib (if registered by midnight May 8), Race Tee Shirt*, Finisher's Towel and entry into Post Race Celebration. * Race Tee Shirt not guaranteed for day of race entries.